By kind permission of Lieut.-Col. J. A. Innes, D.S.O., Commanding 22nd (Service) Batt. Royal Fusiliers. 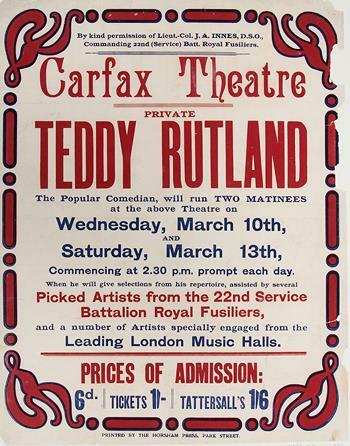 Private Teddy Rutland The Popular comedian, will run Two Matinees at the above Theatre on Wednesday, March 10th and Saturday, March 13th, Commencing at 2.30 p.m. prompt each day. When he will give selections from his repertoire, assisted by several Picked Artists from the 22nd Service Battalion Royal Fusiliers, and a number of artists specially engaged from the Leading London Music Halls.